Marine Le Pen is doing her best to rid the National Front of the image of a skinhead party and make it a respected organization. She sincerely wishes to repair relations with Moscow. So far, she’s been merely an indicator of the prevailing general mood in France: the French believe that their country made a mistake by getting too close to the United States and distancing itself from Russia. France’s National Front wins the local elections. This is the first time that the National Front wins without being part of the election triad in which two other parties – the Union for a Popular Movement (UPM) and the Socialist Party (SP) – fight for each other's voters. This time, the nationalists won in a face-off with UPM. The victory of National Front candidate Laurent Lopez in the canton of Brignoles is a significant event, because it is indicative of serious changes in the political life of France. Can this particular success be extrapolated to the municipal elections in general? The French Electoral Code is fairly complex. Nevertheless, clearly, in most medium-sized cities (with the exception of Paris, Marseille and Lyon, where the electoral system is even more unusual), the National Front will receive more than 10% of votes, which means that the National Front will be effectively represented by the popular vote. The French nationalists are getting out of the ghetto and are becoming a respectable party. Will the National Front be able to run the municipalities, and how does this party expect to go about it: alone or in association with other right forces? The answer to this question depends on the number of elected National Front members. There are small towns, such as Henin-Beaumont, where Steeve Briois from the National Front won more than 30% of the votes during the last elections, and now expects to win almost 40%. Clearly, there are several such towns where the population is hit hard by the crisis. Media prefer not to mention them. This is the main problem. We always talk about the suburbs of Paris, Marseille, Lyon, but never think about the terrible economic situation in towns with a population of 15,000-50,000. Their survival depends on small- and medium-sized businesses, which have been hit hardest by the crisis. They are overwhelmed with a general feeling of being abandoned by the political class, leading to frustration and anger. Given these circumstances, the National Front can provide specific answers to questions asked by the people. In such cities, National Front candidates may well win up to 40% of the vote. If the National Front chooses local party associations, then it may get up to 10-20 medium-sized cities under its control. The next National Front target is to take root at the local level. The party is becoming less dependent on the popularity of its leader, Marine Le Pen (previously, her father), and is increasingly becoming a local force. The third goal is to get ready for the elections to the European Parliament in May 2014. 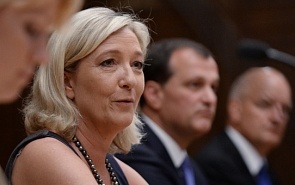 The National Front may well become the second, or perhaps, even the first party of France. This would be a shocking event if it ever happens. Meanwhile, Marine Le Pen is doing her best to rid the National Front of the image of a skinhead party and make it a respected organization. From the economic viewpoint, the National Front program has gone through dramatic changes since 2010. In the past, the party was distinctively marginal. Today, the National Front comes up with much more realistic, mature, reliable and responsible proposals, even though the demagoguery is still there. However, the UPM and SP programs have even more of it. Interestingly, the National Front borrowed certain Communist ideas dating back 20 to 30 years. For example, it now requires Paris to establish closer relations with Russia, not the United States, and also talks about the need to slow down European integration and revive certain forms of protectionism. However nationalists are feared much less than communists were back then. In 1985, the Communists received 15% of the vote, while the National Front, according to the latest opinion polls, has 20%-24% of votes. Clearly, their ideas enjoy wide support on behalf of the French people. In addition, today’s Communists form an alliance with the Socialists from the ruling party and have lost their positions. Their policy now depends on what they can agree upon with the Socialists. No one understands how they are different from the Socialists. Clearly, the tone of their speeches is determined by how many seats they have in the National Assembly, regional assemblies or town halls. It seems that the party no longer has a program of its own and is just trying to preserve what's left of its political apparatus. The French are becoming increasingly aware of this. The National Front today is not what it used to be even 20 years ago. It’s no longer a bunch of extreme right-wing Catholics and refugees from Algeria. This can also be accounted for demographically. Today, 25% of National Front members are under 25 years of age. Will the National Front be in a position to get rid of its xenophobic image? In recent months, Marine Le Pen has been saying that she is not against foreigners. She’s for the French from all walks of life to enjoy more rights than foreigners. However, some National Front members still hold xenophobic ideas. If Le Pen does not stop there, her success will put into question the existence of a number of European standards. For example, they might decide that each country should be responsible for its immigration policies. Perhaps, the European politics are about to return to realism. Personally, I’d like to see this happen. However, it all depends on the success of these parties during future elections. Interestingly, when the Front was created in 1972, it was a very pro-American and anti-Soviet association. Now, Marine Le Pen sincerely wishes to repair relations with Moscow. So far, she’s been merely an indicator of the prevailing general mood in France: the French believe that their country made a mistake by getting too close to the United States and distancing itself from Russia. This is partly confirmed by remarks by former Prime Minister Francois Fillon at a recently held Valdai International Discussion Club where he essentially recognized the correctness of Russia’s stance on Syria and criticized the French policy. The French are increasingly concerned about the need to restore balance in its foreign policy. This article was originally published in Russian in «Известия» newspaper.